Whether you are traveling for business or pleasure, a suitcase is a must when packing for a trip. A suitcase allows you to neatly store all of your items in one zippered bag that can easily be transported during your travels. The most popular brands of luggage include: American Tourister, Delsey, Olympia, Samsonite, and Travelpro. 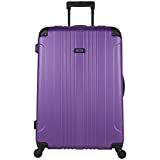 You’ll find that the biggest advantage of any suitcase is that they usually have wheels so you can roll or push it instead of carrying a bunch of bags with you when you travel. When selecting a suitcase, there are three main styles. These include hard side, soft side, and duffels. Some people prefer hard side suitcases when traveling because they may better protect the contents in the bag from rough handling at the airport when your bag is being loaded on the plane. The most common type would be the soft side suitcase. The benefit of a soft side suitcase is that it gives more convenience when trying to zip an over-stuffed bag. Some even have a built in expander that will give you an extra few inches of packing space if come home with more than you took. Duffel bags are not as structured as hard or soft side suitcases but they provide tons of space for packing many items or odd shaped things. They work well when trying to cram a lot of luggage in your car for a family vacation. Where to Purchase a Suitcase? Traveling can be expensive and you don’t want to waste your money on the suitcase. Save your money for dining and fun experiences while you travel by buying a cheap, reliable suitcase. These can be found online through Amazon, at department stores like Kohls or TJ Maxx, or at box stores like Walmart or Target. Your suitcase doesn’t need to have a bunch of extras as long as it safely holds all of your belongings and is easy to take with you. Before buying a suitcase, check the dimensions, weight, material it is made from, type of wheels, and its storage options. Which of these features are important to you will vary depending on what you are packing and where you are traveling. Different travel needs determine the type of suitcase you may want. For example, airlines have size limits for carry-on bags that will be stowed overhead. If you wish to carry-on your luggage, check with your airline to find their requirements. Usually, small suitcases around 22″ will fit but it is always a good idea to confirm this before traveling. Also, if you are planning to fly and check your luggage, airlines usually have weight limitations on each suitcase. Usually this limitation is 50 pounds, so you will want a light weight suitcase allowing your belongings to take up most of that weight. Again it is always best to confirm the weight limitations before you get to the airport so that you don’t get hit with an extra fee for an overweight bag. This soft side suitcase is extremely lightweight. 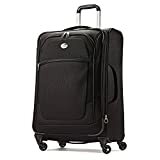 It has spinner wheels for easy rolling through busy airports or down hotel hallways. There are mesh storage pockets inside which will help you quickly locate your items. It also expands to allow effortless closing when full. Its dimensions are 10 x 19 x 28 inches. 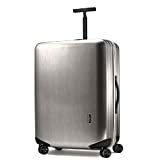 This piece of luggage is made of 95% ABS which is an impact resistant material that is great for travel where your suitcase may get tossed around or dropped. ABS is also lightweight so you won’t have to worry about carrying a heavy bag. Additional zipper pockets are included inside to help keep you organized. Its four wheel constructions means it can roll easily in any direction. Its dimensions are 11.2 x 28 x 17.6 inches. This suitcase is lightweight and durable. It has both interior and exterior pockets for limitless organization. The four multi-directional spinner wheels will allow you to push or pull this suitcase wherever you go. Its dimensions are 25 x 18 x 10 inches. Made from durable 100% Polycarbonate fabric, this hard side suitcase is large and spacious. It still manages to be relatively lightweight too. An added bonus is that this bag has a three-digit TSA lock that you can use to secure your belongings. Its dimensions are 27.8 x 20 x 11 inches. Need a suitcase that can stand up to frequent, long trips? This is the perfect bag. Its exterior is 100% polycarbonate. The front exterior compartment can even accommodate a 15.6 inch laptop. With spinner wheels, a 3 dial tsa lock, and self-repairing zippers, this suitcase will keep you traveling with ease. Its dimensions are 29 x 19.5 x 12.5 inches. For those looking for a smaller bag for weekend travel, consider this duffel bag. It rolls easily on recessed in-line skate metal ball bearing wheels. It has a hideaway pull handle, 8 roomy pockets, and self-repairing zippers. Its dimensions are 12 x 12 x 22 inches. This larger duffel bag is similar to the Olympia 22″ duffel bag but provides additional storage space. It also has recessed metal ball bearing in-line skate wheels, retractable handle, 8 useful pockets and a spacious interior compartment. Its dimensions are 15.5 x 33 x 14 inches. If you are considering several suitcase sizes, why not purchase this 3 piece set from Samsonite? 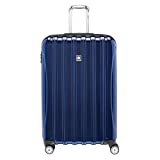 It includes 20″, 24″ and 28″ suitcases so you will never be without the perfect suitcase for any trip. It also includes a side mounted TSA lock and interior organization pockets. The largest suitcase’s dimensions are 28 x 19.8 x 12.5 inches. This suitcase is made of 100% Polycarbonate. It is durable and made with an exterior material that avoids scratches. The suitcase is roomy without being too large. But, if you need more space, it can be expanded. It has a TSA approved side mounted lock and 10 zippers. Its dimensions are 28 x 19.8 x 12.5 inches. Very few travelers look forward to packing to go on a trip. With one of these affordable suitcases in your home, you will be ready to quickly pack your belongings for your next business trip or family vacation. Then, put your suitcase out of your mind and focus on whatever adventure you may have planned.